The reach in closet is one of the most versatile assets of the home. By reach in closet we mean the standard closet built into the wall of most homes. It is usually around 24 inches deep and includes a rod for hanging clothes with some sort of shelf above the rod. One of great things about it is that no matter what type of home you have — house, condominium, townhome, trailer, rental apartment — you probably have more than one reach in closet as part of your home storage. 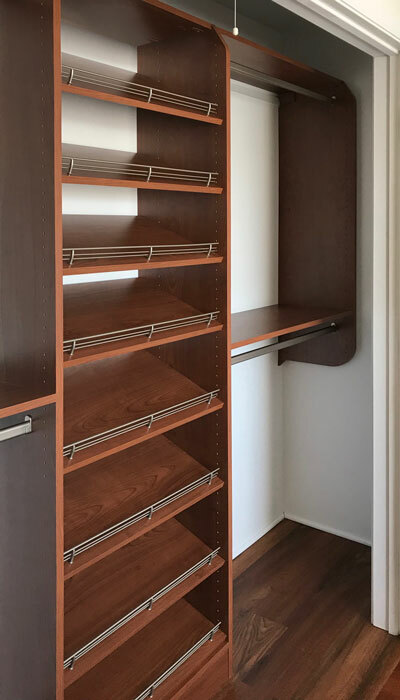 Remodeling one or more of these closets with a custom closet organization system that includes ammenities such as double hang rods, shelves and maybe even drawers, can provide a lot more storage per closet. By maximizing the storage in this way, you might not need as many closets. This opens up the possibility of converting some of the reach in closets to other purposes through use of custom built ins. Some of the most popular and successful closet metamorphoses include the Closet to Beverage Bar and Closet Into Desk transformations. The reach in closet to beverage bar remodel is fairly straightforward. It can be accomplished by a handy homeowner, but most people will want to consult the pros if you require an elctrical hookup for a beverage cooler or plumbing if it is to include a sink. The first step is to remove the doors, closet rod and shelf from the existing closet. Removing the baseboard as well will ensure a tighter fit to the wall for any new cabintry. Many people will also choose to remove the section of wall above and along the sides of the door opening to allow new cabinets to be run up to the ceiling and new caninet doors to open flush to the wall, but this is optional. The walls inside of the deconstructed closet should be patched and painted before installing any new components. 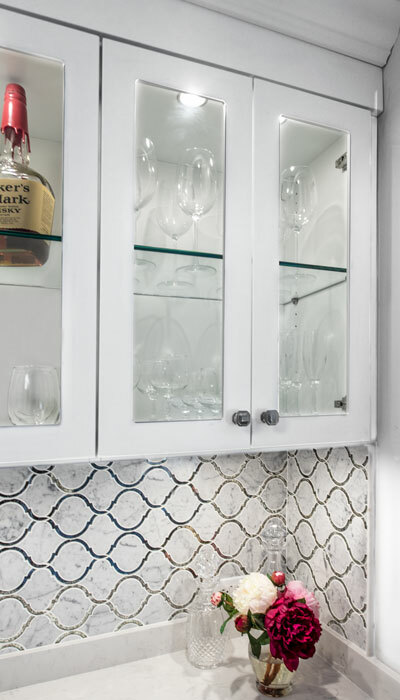 If a wine cooler or under-the-counter refrigerator is to be used in the design, add an electrical outlet 12 to 18 inches from the finished floor. Using a recessed outlet designed for appliances will allow you the ability to push your refrigeration unit tightly against the wall. Add 34-1/2 inch high base cabinets with toe kick along the bottom of the closet. This is a standard height, but the width of the cabinets will be custom for each project depending on the width of the closet and whether the walls on the sides of the door opening have been removed. 24 inches is the standard cabinet depth, which coincides nicely with the depth of the average reach in closet. These dimensions are the same as those used in kitchen cabinets. When you measure the width of the closet for the cabinets, take a measurement at the top, middle and bottom of the closet. Chances are these numbers will be different, because walls in most homes are not exactly straight. Measure the closet in three places and use the smallest measurement as the total width for your cabinets. Subtract any width needed to accommodate your chosen refrigerator, and you will be left with the dimensions of the cabinets. 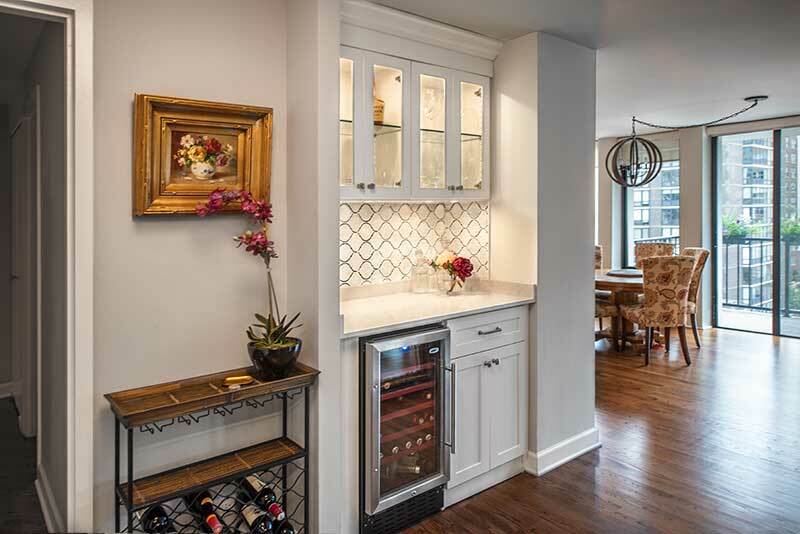 This beverage bar in the hallway used to be an entryway coat closet. You will be happiest with the end result if you plan in advance for what you'd like to keep in your cabinets. Do you need a drawer for cocktail napkins? How about a corkscrew or beverage coasters? Small items are better kept in drawers, so include a drawer in your design if you intend to keep small items handy at the bar. 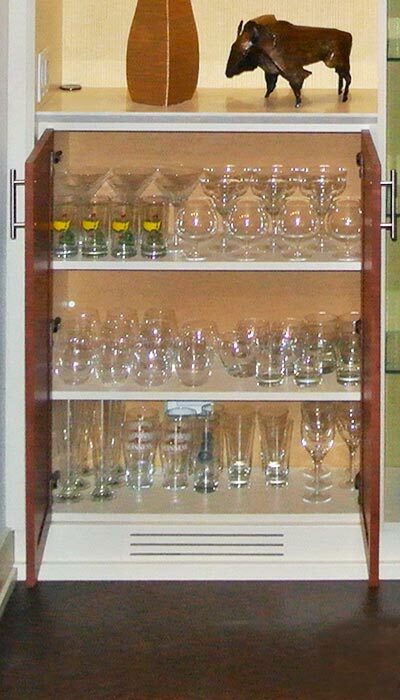 Lower cabinets can store liquor bottles, glasses and other assorted barware. Glass shelves and/or cabinets with glass doors work really well above the base cabinets. The glass takes up less visual space than other materials typically used for storage. They are very pretty with clear glasses stored on them, especially when lit by an LED lighting system. The same LED lights used for closets can be used on a beverage bar. Available in both cool and warm light temperatures, this type of lighting can be installed by your average handiperson and does not require an electrician. Turning a closet into a small office with a desk is a popular closet remodelling project. People who maintain their desk/office in the bedroom are especially good candidates for this type of closet remodelling project. It is nice to keep a mental separation between your work and rest spaces. When these rooms are one and the same, a closet into desk renovation can provide enough separation to fill this need. 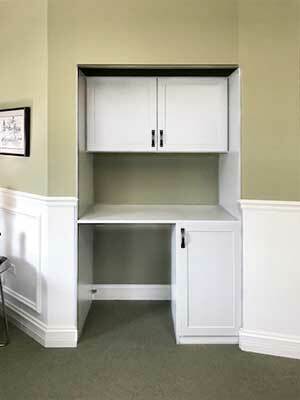 Begin this renovation with the same tear out and paint procedure outlined above in the Closet Into Beverage Bar transformation, however, you will not need recessed electrical outlets for your new desk/office. You can install a standard outlet behind the desk for your desk lamp, printer and computer charger. Use a standard lower cabinet with base on at least one side of the closet to support the desk. More can be used if it is a very wide closet. 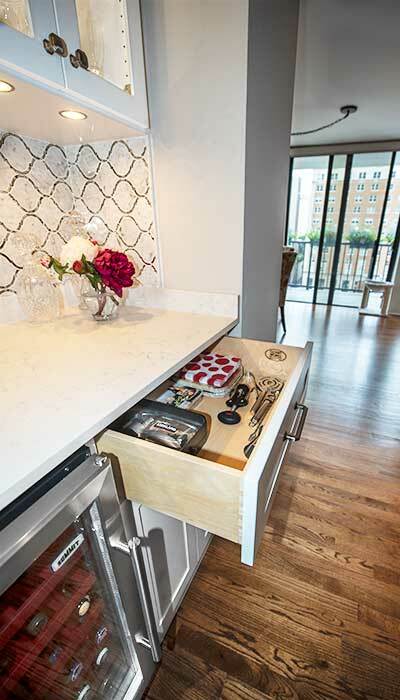 When positioning the base cabinet, be sure to leave enough room to be able to fully open the drawers and doors. If you leave the walls/return surrounding the old closet doors in place, you may need to move the cabinet in a few inches towards the center to ensure the drawers are free to open and won't hit the wall. If any gaps show, they can always be covered with a piece if trim. 42 inches is optimal for leg room under the desk. 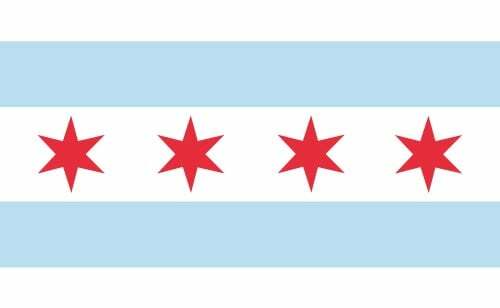 Subtract this number from the total width of the closet when figuring out how wide your cabinet base for the desk should be. 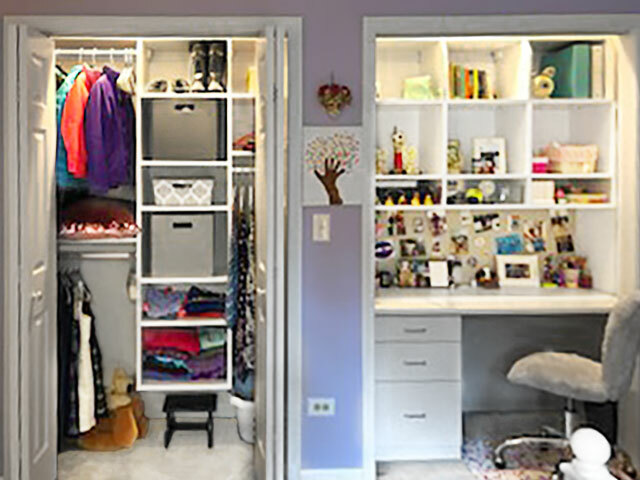 The desktop should span the entire width of the closet. It needs to be at least 24 inches deep, but a couple of extra inches overhang on the front is nice if your closet is deep enough for this. The desktop will be supported on one side by the base cabinet. A cleat (similar to a 2 x 4 piece of lumber) should be mounted to the open walls without a base cabinet to support the desktop. It must be secured to the studs under the desk at the same height from the floor as the base cabinet. This will provide a very strong support for the countertop. Use whatever countertop material you like, however, laminate or veneered wood over particle board is most often chosen. Either open shelving or upper cabinets can be installed above the desk for additional storage. The the underside of the bottom shelf or cabinet is the perfect place to install task lighting. This can be a simple LED closet lighting system. 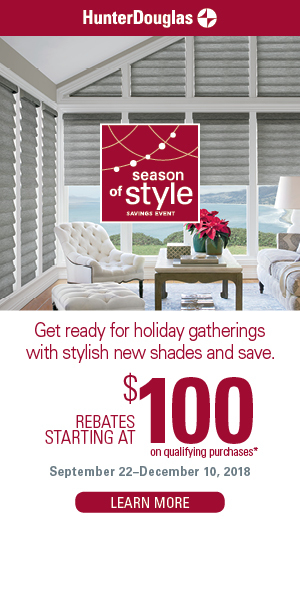 The final result will be a cozy office nook that is both productive and aesthetically pleasing — a joy to work in. This lucky young lady's bedroom contained two reach in closets. 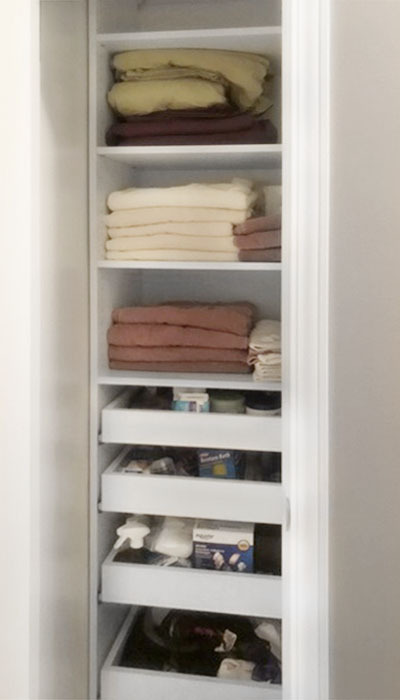 A custom closet system with double hang closet rods and multiple shelves increased the available storage in one closet to the point that the second closet was no longer needed for clothing. That space was freed up to become a private study. A "closet into desk" remodeling project created the perfect private alcove for doing homework and a place to display some hard earned treasures. The typical reach in closet provides a myriad of opportunities, both for traditional closet storage and other types of custom built ins. Before beginning your closet transformation, it is advisable to first maximize the amount of available storage in the remaining closets not marked to be renovated into something other than a closet. A good closet organization system will allow these closets to handle more storage in the same amount of space, ensuring that you don't miss the old closet space or lose any storage potential in and around your home. This was once a small closet/alcove next to the fireplace. A cabinet with glass shelving above and lighting system transformed the space into a convenient beverage bar. It is important to maximize the storage potential of your remaining closets before converting any closets to beverage centers, wine bars, closet desks or home office alcoves. A good closet organization system will ensure that you don't miss any of the old storage space. This narrow closet was transformed into the perfect spot for open linen storage through the addition of custom built ins. This reach in closet was transformed into a home office nook.